Happiest of Tuesdays! I am back with week 3 of the fall collaboration series with nine other fabulous bloggers! If you missed the other two weeks, you can see which summer piece I am repurposing for fall here and what my holy grail fall piece is here. This week we are here to close out the series sharing our ten take on our favorite fall trend. 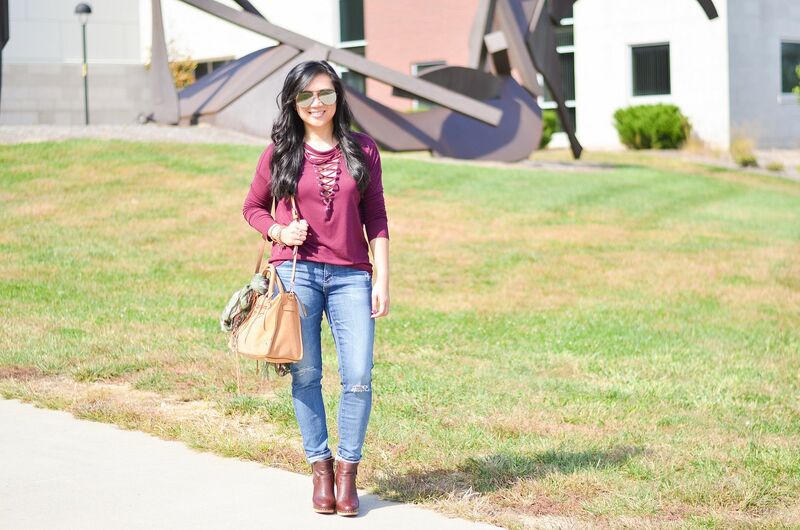 I was originally going to cover the cold shoulder/ off-the-shoulder trend since I just can't get enough of it, but at the last minute, I realized that I have this growing obsession with all the lace-up and crisscross strappy details. 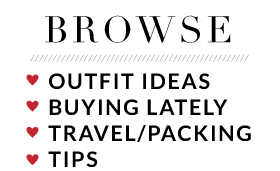 What I love most about it is that it adds instant interest with basically no extra effort. If anything, it's a time saver because I don't feel the need to add any necklaces. The lace-up detail speaks for itself and makes quite the statement. It turns the basic of basics into an interesting piece. This outfit is just a simple tee and jeans, but it feels *more* than that to me thanks to these cross strappies. I found this top at my local Express about a week ago. They said they had only had it in store for about 3 days, which explains why I did not see it online when I was shopping their crazy sales! (It's there now though, shop it here!) But I'm glad I stumbled upon it in store! It lives up to the softness and comfort as their other One Eleven tees. It's probably a good thing it isn't online yet because I may have bought all the other colors by now! My top is pretty blatantly strappy, and if that's too bold for you, you can always introduce this trend in smaller doses. 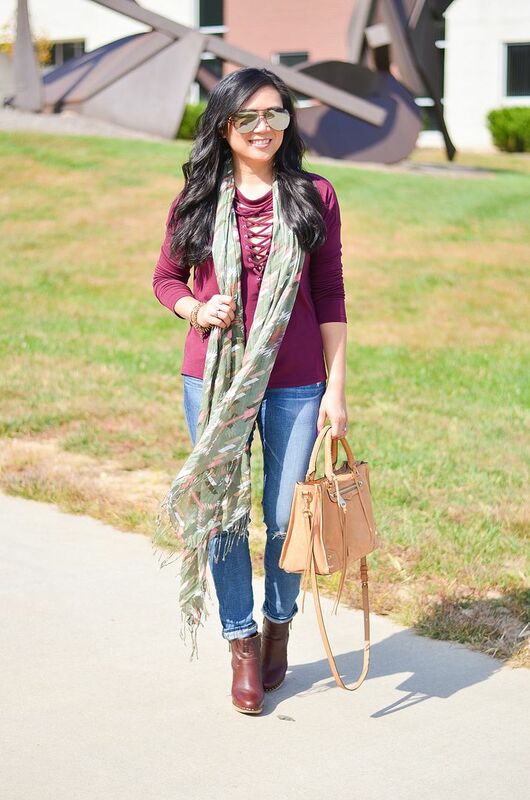 This sweater kills two trends with one stone for me by pairing the lace-up detail with the cold shoulder! The green sold pretty quickly, but it does also come in black and a little birdie told me that there are other colors available in store! It's definitely my favorite sweater of the season at the moment! Another great way to sport the trend is with layering camis. I love that you can turn any v-neck sweater into a trendy piece with the help of a strappy cami. I posted this outfit on the blog yesterday and I'll share better photos of the cami below so you can get a better idea of the fit. Bralettes are having a resurgence at the moment, and for good reason. I love that you can wear them under the thinnest of tops and it doesn't add any bulk. Express has some good options right now like this one. I just really love the aesthetic! Here's a better look at the cami and a current option for a v-neck top that you can pair it with. I am wearing an XS in both of them. I also just got this lace-up plaid top, which is uh-mazing! It's a super soft plaid, almost like a lighter-weight flannel. I'd say it's pretty similar in material to the oversized plaid tops that I love so much. I hope I've convinced you to give it a try if you haven't already! There are so many good pieces out there, it's almost unavoidable at the moment! 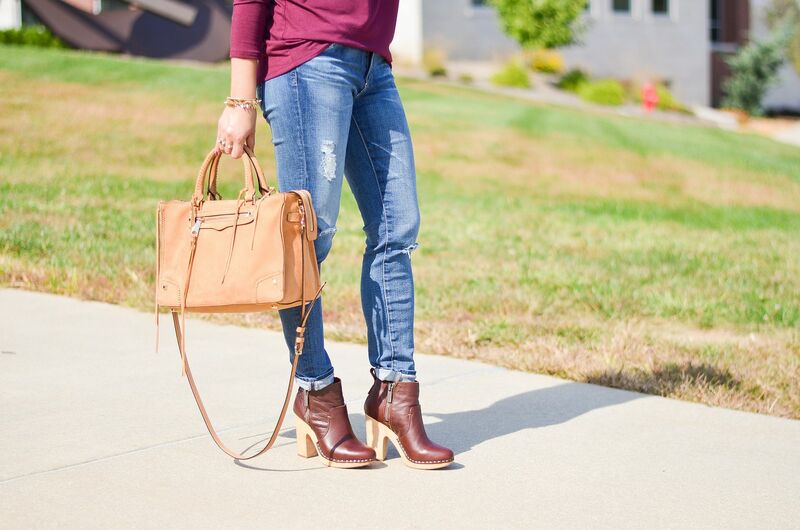 What other fall trends are you stalking? Click the thumbnails below to see what the other gals are craving! Oh I love this neckline, such an easy way to spice up an outfit! I have a couple of deep v-neck tees, I think I may need this cami too. These sweaters are so fabulous on you! I love the lace up detail right now, and I definitely need a sweater in my possession asap! I know this is about crisscross tops, but first I have to say you have the best collection of denim, too!! Really love the way you are rocking this trend! And I am pretty sure I will have to get that sweater if it's still around by the holidays. It's still too soon for sweaters here (temps in the 90s again later this week, eek), but by winter it should be sweater weather! 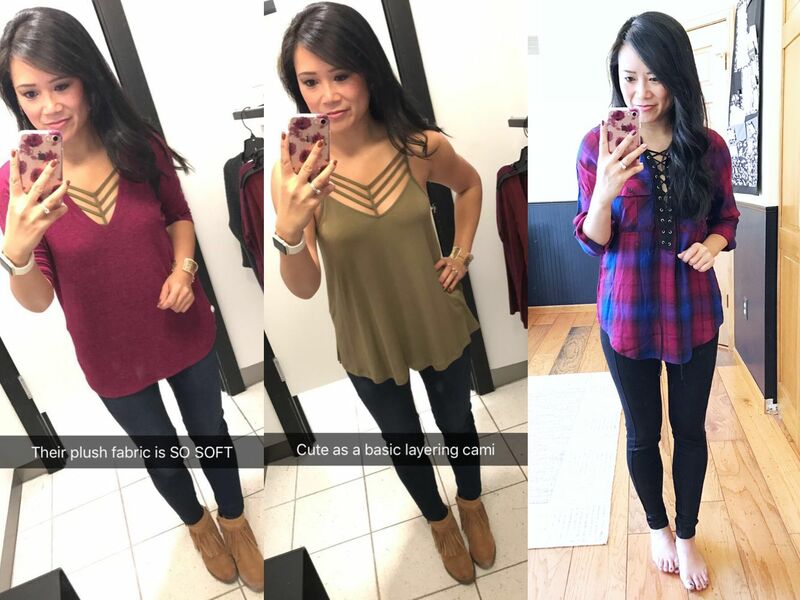 I am loving all these fabulous criss cross options! That olive sweater is gorgeous! And I love all the ways you've layered, too. It adds so much interest to an outfit! So cute, I love a basic top with details that make it special. The strappy trend is definitely huge and I want one like yours! I need long sleeves in my wardrobe, I don't have any really! 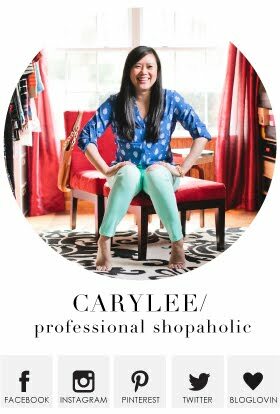 Love the looks Carylee!! These sweaters are SO CUTE! Stopping by from the Confident Twosday linkup! That lace up top is so pretty! I love the deep wine color! 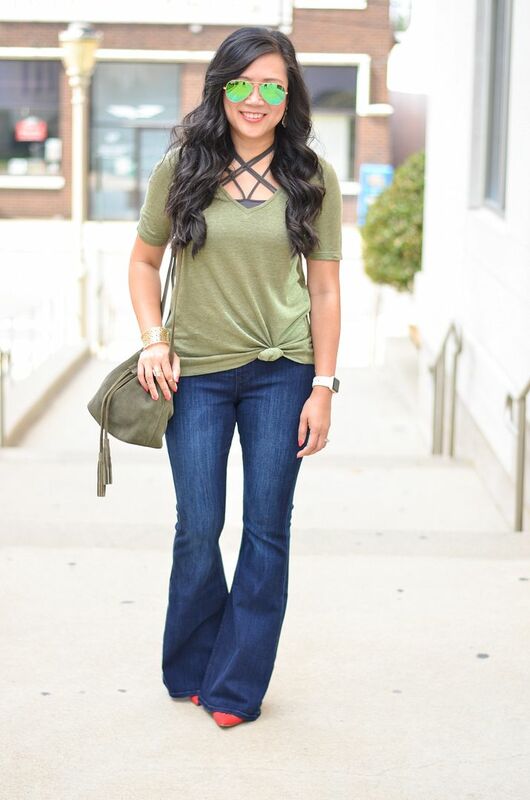 That olive t shirt with the criss cross underneath is so much fun! It totally adds to the whole look!